That’s what donors want to see evidence of in charity communications. They want to know how their money is spent and what impact it has on people’s lives. 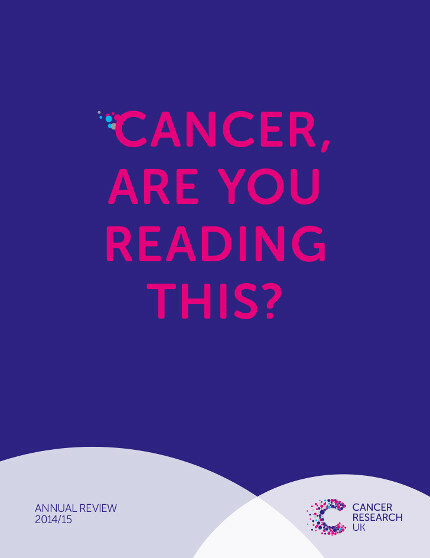 I’ve worked with Cancer Research UK on their last seven annual reviews to help convey these messages. Working in partnership with my colleague Sarah Myers on the projects, we turn complicated scientific language into easy to understand copy. We speak to volunteers, scientists and people living with and affected by cancer to show how Cancer Research UK’s work helps to improve and save lives. The annual review is a flagship publication for the cancer charity and has been praised in the third sector for its accessibility and clarity. I’m proud to have worked with Cancer Research UK on so many of their annual reviews and am pleased to be doing so again for the 2015/16 annual review. Working in partnership with Sarah means we offer extra value as we edit each other’s copy and can meet tight deadlines. Sarah and I often work together on projects, giving each other’s work a “second eye”, meaning our clients benefit from an additional expert perspective. View Cancer Research UK’s Annual Review 2014/15.